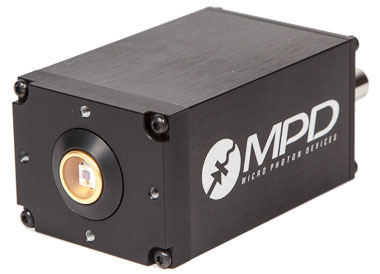 MPD in-depth know-how of SPAD device fabrication and gated/free-running active quenching electronics has led the company to develop and market a comprehensive family of Single Photon Avalanche Diodes (SPADs), fabricated either using custom Silicon, standard CMOS or InGaAs/InP technologies. These are self-contained modules that meet the low light level analytical detection demands, down to the single photon level, with high photon detection efficiency (PDE) and low internal “noise” (i.e. the dark-count rate (DCR) and afterpulsing) for application such as confocal microscopy, fluorescence, luminescence and TCSPC. The SPAD is a reverse biased p-n junction, working with an applied voltage well above the breakdown voltage. This implies that the electric field in the depleted region is so high to be able to trigger an avalanche multiplication process and to self-sustain a current flow after the generation of only one electron-hole pair, e.g. due to the absorption of a single photon. Once a photon an avalanche is generated, the current swiftly rises with nanosecond or sub-nanosecond rise time to a macroscopic steady level in the milliampere range, which can be easily discriminated. If the primary carrier is photogenerated, the leading edge of the avalanche pulse marks the arrival time of the detected photon. After the avalanche is triggered, the current keeps flowing until the avalanche is quenched by lowering the bias voltage down to breakdown voltage or below. The bias voltage is then restored in order to detect another photon. This operation requires a suitable circuit that is usually referred to as a quenching circuit. Because of the similarity with the behaviour of Geiger-Muller detectors, SPADs are referred to work in “Geiger mode”. As in any other sensors, SPADs have their own internal noise which is due to thermal generation effects that produce current pulses even in the absence of illumination, called dark counts (DC). The rate of these dark counts (DCR) increases with the temperature and also with the overvoltage. A secondary noise source, called afterpulsing, may strongly enhance the total dark count rate. This is caused by carriers trapped during the avalanche formation and which are subsequently released. These carriers are accelerated by the intense electric field across the junction and can retrigger another avalanche, generating afterpulses correlated with a previous avalanche pulse." Our photon detectors cover the electromagnetic spectrum from the near infrared all the way up to the near ultraviolet. From single pixel to multidimensional array of CMOS and InGaAs/InP Detectors, our photon detection technologies are intended to address customer high-performance and applications, even in high-volumes …because every photon counts! MPD’s current instrumentation includes quantum random number generators, integrated time correlated electronics as well as delayers and fast gating modules. MPD’s entire product range is designed and built to be fully RoHS-compliant.